Here on Gaming Reinvented, we’ve interviewed a fair few people from Mario Fan Games Galaxy. There was the one we did with Thunder Dragon back in 2015. Another with DJ Coco a bit earlier than that. And well, with almost every staffer from Guinea to VinnyVideo having done interviews here before, some may say we’re almost out of Mario fan game devs to interview! But that’s today. Because as the title points out, we’ve managed to secure another interesting fan game developer interview! This time, with MFGG staffer and game developer Miles, who has previously created a contest winning game called The Purple Coin. So sit down, make a cup of tea and get ready to hear what Miles has to say about his history with Mario fan games! 1. Starting with the usual personal background question. So you know the drill now. Can you tell us a bit about yourself? What’s your story outside of fan game development? I don’t find that there’s much to be said about myself; I’m a pretty uninteresting fellow outside of fangaming. I’m a stay-at-home person that helps my dad with his business for work. That’s pretty much it. 2. How about your video game history? What game got you interested in gaming anyway? One could say that I started life with a Sega Genesis controller in my hand. At as young as age 3 I was playing games on that thing and loving them. The fun I had in my early years with the Sonic series and other classics such as Dynamite Headdy and The Lost Vikings (go play those immediately if you haven’t and can legally do so) got me more or less cemented into gaming. I’ve had stuff from most generations since. 3. And how did you get started in Mario fan games anyway? My Mario fangaming journey actually sort of began with Sonic fangaming, since that’s where I first learned that I could make things of my own. Sonic Fan Games HQ introduced me to The Games Factory around 2003-2004, which introduced me to game logic. During a conversation on AIM with a fun fellow I’d met elsewhere, I was introduced to Game Maker with a game he was working on at the time. Not too long later, I wound up at Mario Fan Games Galaxy, though how exactly I came across it is a mystery. By then I’d been doing a lot with both The Games Factory and Game Maker and was able to do a fair bit of what I wanted to with them. I didn’t really become very active at MFGG until many years later, though. In time, probably around 2009 or so, I found that Mario was significantly easier to do solo fangame work with than Sonic, so Mario more or less become my focus at that point. 4. Onto Super Battle Bros now. What gave you the idea to make a Mario fighting game? In response to my previous fan game not quite working well, I started a new project with the aim to have a better engine. I had formed a huge AI obsession at around that point, so in order for me to scratch that figurative itch I put together a one-screen game where an AI Luigi fought a player Mario on a stage with a ground area and a solid floating platform in the center. 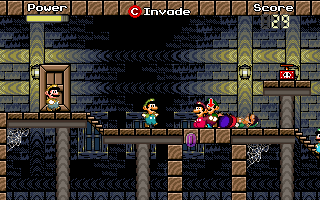 The AI Luigi was able to run around the level and eventually reach Mario when there was no line-of-sight beforehand. It just grew into a fighting game from there. It was supposed to also have a story mode with it to be in line with the game I was trying to make before it, but that part of it never quite got anywhere. I think it came from a small level of necessity. The NES stages I made didn’t work very well without this system, but I wanted them in one way or another. Only one stage used the SMB3 theme, which was rather unfortunate because someone kindly made a SMB3 sprite set for me for that purpose. Huh, I didn’t even know that an official game had done this until now. I don’t quite remember if I came up with the idea in my own head first or straight up took the idea from another game that did it before mine, but I do remember that it made sense to me from a fun perspective. I had made most of a game of the same name before this one that also had that feature, though it was a more adventure-focused game. 7. Either way, there’s a pretty crazy amount of settings in this title. 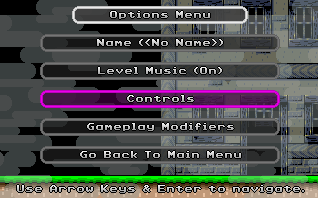 You can customise basic physics aspects, the enemies, the controls, what items spawn and god knows what else. Was this to try and provide a Smash Bros style experience with lots of customisation? Believe it or not, Smash Bros wasn’t really considered while in the process of working on this game. I had a ton of fun working on it and that’s the key word – fun. If I thought of something fun and could do it, I did it. The number of options was a result of both me going nuts with setting ideas and as a result of feedback from people on the MFGG forum. 8. Still, let’s talk about the levels now. What was the thought process behind them here? Why say, Mario Bros style sewers or Rainbow Road? Funny you mentioned those levels in particular; they’re the oddball stages, and I ended up using them again in my next game. Most of the levels were just themed on the levels that were to be in the scrapped story mode and were pretty much just thrown together, but those two are a bit different. The Mario Bros stage one I think was based on me having recently played some version of that game and thinking it would be fun as a fighting arena. Apparently Smash Bros Brawl had already done this, but here you could safely wrap around the screen oops-free. The Rainbow stage was based entirely on me being a huge fan of actively rainbowy scenery, and something similar to it will be in every Mario or platform game I ever make. 9. How about the characters? Mario & Luigi are obvious, but who’s the blue Mario clone supposed to be? I had started idea work on a story involving a cloning machine, but I didn’t ever get the details ironed out that well. Basically, Bowser found a cloning machine and attempted to use it for evil purposes, but he gave up and left it alone when it didn’t appear to have worked immediately. Some time later, Clone Luigi was to appear out of nowhere, but it would turn out that he was only be the first clone to appear. It was a bit nuts. 10. But hey, let’s to The Purple Coin now. Where did this idea of possessing your enemies come from? Not too many days before this game was started, I remember my friend coming over with his Xbox 360 and showing me a game where you could temporarily remotely control things. He demonstrated it with a fish. I have absolutely no clue what the game was or why you’d possess a fish, but I found the idea rather amusing. I don’t know if I actually had that game consciously in mind when I came up with the idea for my game, though. It’s also likely that the whole possession idea stemmed from something else I was doing around that time: a weird Halo ripoff I was working on had me playing with the idea of there being one controller object and multiple player objects, being able to swap between them freely. 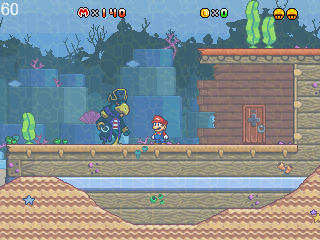 scenery, and something similar to it will be in every Mario or platform game I ever make. I just let the basic story write itself when the game was done, because all of my focus first went into the gameplay itself. 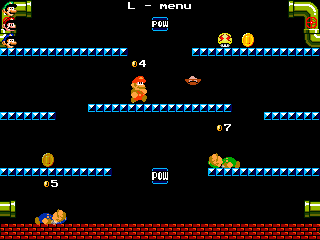 The game idea came from the Minigame competition at the time, the theme being Coins. It was pretty open-ended, and a few days in it occurred to me that I could do something with it. I’ve never really been good when it comes to ideas, but I lucked out when I started playing around with the immediate base idea of just straight up playing as a coin, at which point the concept I went with came to mind: Instead of being a Bro collecting coins, you’re a coin trying not to be collected by Bros. At that point I just went with the obvious story that came with the concept. 12. Interestingly, the game seems to have a bunch of modifiers too. Like cheats unlocked by doing well in the game. What gave you the idea to implement that system? This aspect came fairly late in the game’s development – that is, after it’d been released twice already! I at first just wanted ways to unlock levels that didn’t boil down to merely more “get X score” requirements, because that was boring for as many levels as the game now was to have. Unfortunately, just unlocking levels was also boring, so I threw in some fun things on the side. It seemed like a decent way to give the game a bit of replay value without it being utterly flavourless padding. 13. Or the complex options here in general? Cause for a game based on a fairly simple premise, this has a lot of options and replay value to it. Do you always try and make your games as feature complete as possible, regardless of the premise? My hope throughout making The Purple Coin was that the game was fun to play, and in the case of the final version, that it was worth playing again later. In the case of my Super Battle Bros, it came from things I just wanted to add anyway and from feedback. My games winding up being more feature complete was more of a side effect than a direct goal. 14. Apparently, this game started off as the winning entry in a MFGG contest about coin based games. So what did it feel to have so many people not just like your entry, but think it should be made into a full game? Did you expect so much praise for the concept and game as a whole? I most definitely did not expect the reception it got! I figured the idea at the very least would be thought of as a cool one, but the whole game being as well received as it was surprised me a fair bit. This is especially so considering how much of a buggy mess it was at first and still sort of is. I was at first confused by folks saying it needed to be made bigger (it was a mini-game for a competition, it was supposed to be a small experience! ), but I’m very much glad that I did so in the end. 15. A few general game design questions now. Firstly, have you considered making a longer or more adventure driven game? Like say, a standard 2D Mario platformer? I sure have! I’ve not yet been able to do this and complete it, but I’ve given this a try a good few times. My first Mario fangame, which was also named Just For Fun but made before the now-released Super Battle Bros, was an adventure-driven game. Super Battle Bros itself was supposed to try and continue with the idea later in its own development, but it didn’t work out due to engine troubles. (That and I was having too much fun working on the fighty part.) If I somehow ever get the time again, I’ll probably try and continue with the ideas I had for it. I’ve worked on quite a few personal projects, but all of my non-Mario stuff has been made specifically to cater to my own tastes and I can guarantee they’d not be received as well as my Mario fan games. But as far as doing something straight up indie goes, I am unsure I’d be able to strike gold once more in the ideas department. I haven’t really tried to give it a shot yet, though. Maybe someday! 17. And talking of these interesting concepts… What inspires you to create a game anyway? How do you decide “this could be a great little game” and start making it? For me it’s a bit of a selfish impulse, but it does the job. If there’s a game idea of something I’d personally want to play and I can make it, I start it up and see what happens. The process is pretty fun if I can keep throwing ideas that I want into it or the engine itself is satisfying to work on. That fun is what goes the game creation process going. That’s pretty much the extent of it! 18. On another note, you also seem to be a staff member at Mario Fan Games Galaxy at the moment. How did that come about? It’s been quite a while since my initial promotion, so details are a bit fuzzy. Mario Fan Games Galaxy had been toying with the idea of reopening its forum’s General Chat, since previously said forum was 100% fangame-focused and there was some notable demand for a bigger community aspect. It needed a mod that could be around more often than the admins were able to at the time. I recall that at some point that had I bugged Elyk on AIM about things on the forum here and there and he asked me one day something to the effect of how often I could be online. Days or perhaps weeks afterwards, VinnyVideo talked to me on Skype about potentially being the new mod for the grand reopening of the General Chat, and I happily accepted it. I think that’s how it went, at least. This is currently my second run as a staffer. Things got amazingly bad for me at some point in 2013, so I had to step down for a while until I got myself back together. I think VinnyVideo brought me back on-board. 19. Heck, what’s it been like as a staff member anyway? We’ve asked this to quite a few other MFGG admins and moderators before, so I’m curious how your experience has been here. It can be nice at times and not-so-nice at others. It’s fun and nice to able to discuss stuff about decisions governing MFGG with other staff members, and to do things like handing out badges. Sometimes though you have to make unpopular decisions (for what is believed to be the greater good, though with community input and desires always in mind) and get hit from disapproving voices you’ve opened yourself to, be it on the forums, site, or in private. But that’s fine – that’s simply how it goes. We’ve recently had some talk of an overhaul or relaxation in moderation style, which has certainly been something. 20. Is there a possibility in future that you might decide you want to stop being staff? Or stop making fan games in general? I don’t really foresee myself wanting out any time soon, though in the future it’s possible I’ll wind up moving on if I get to be too busy. As for fan games, definitely so. My motivation has heavily moved towards non-fangame projects. 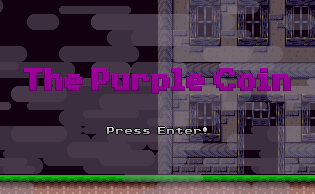 I’m reasonably certain that Purple Coin 2 will be my last fangame if I ever get to complete it. 21. Finally, what advice would you give to other people wanting to get into fan game development? I reckon you should make little things and move up with the difficulty of the things you’re making until you’re very comfortable with the program or programs of your choice that are involved. Don’t go for something super big right off the bat; figure out stuff first. Don’t be afraid of criticism – it’s something that can go a long way to making your projects (present and future) the best they can be. Well, I think that goes for us all really. Don’t be afraid of criticism, since it’ll go a long way towards making your projects the best they can be. Maybe if Digital Homicide and Matan Cohen took that to heart a while back, the gaming world would be a lot better off. But hey, that’s all water under the bridge now. So what do you think of the interview? Did you enjoy hearing what Miles had to say about his work? And heck, who do you want to see receive an interview here next? It would do you some good to get an editor.